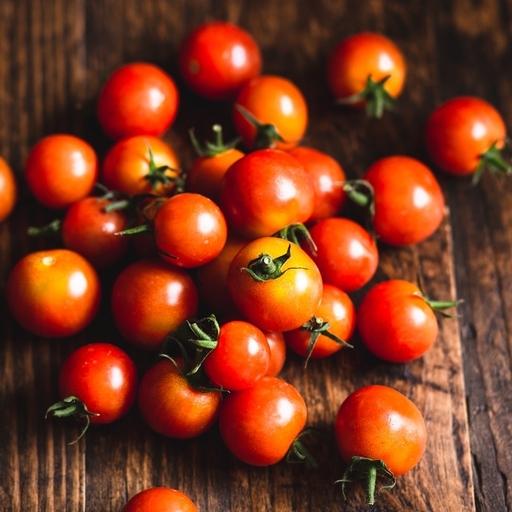 We grow organic cherry tomatoes for flavour, trialling, testing and tasting until we find the best varieties. They’re sweet, deeply flavoured and bursting with juice. Local isn’t always best! When our own tomato season is over, we truck over naturally sun-ripened ones from our friend Paco in Spain. This uses just a tenth of the carbon compared with growing them in the UK using heat. Use fresh in salads or add to sauces, soups and savoury dishes. For cherry tomato pasta, throw in a tray with a splash of olive oil, garlic and herbs and roast until sweet and sticky. Turn through the cooked pasta of your choice, sliver over some Parmesan and you’re done.